CO2 emissions, noise, and soot particles from diesel engines are a thing of the past—the Kramer KL25.5e is the first all-wheel-steered fully electric wheel loader. The new cost-efficient and emission-free electric drive enables work in buildings and noise-sensitive areas. The KL25.5e features a compact design and outstanding maneuverability thanks to all-wheel steering. An electric motor is built into the drive system which provides great performance and tractive force. A second electric motor controls the work hydraulics. The right performance is delivered by the engine depending on the wheel loader requirements and its area of application. 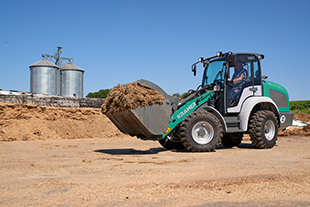 Kramer pays special attention to meeting customers' various needs and is able to offer a fully electric wheel loader with the same performance parameters as a diesel-powered vehicle. The KL25.5e is an entirely unique product because it is the only electrically operated wheel loader with all-wheel steering in its size class available on the market. The increased initial investment costs will soon be outweighed by the significant savings made from reduced operating and maintenance costs compared to a diesel-operated vehicle. The KL25.5e protects operators and animals, your most valuable resources, against noise and exhaust gases. Being emission free means actively protecting the environment. You can even use your own produced electricity to charge the KL25.5e. Thanks to a stacking payload of 1,750 kg, it is now possible to heavy loads using an electrically operated wheel loader. Hence, the KL25.5e is the perfect workhorse. With the KL25.5e you do not make any compromises: reliability as well as performance do not differ at all from similar diesel-powered machines. Depending on use, the batteries can hold a charge of up to 5 hours. It takes six to seven hours to charge with the option of intermittent top-ups. The Sommets d'Or competition is an innovation competition open to all exhibitors at the Sommet de l'Élevage that honours equipment, products or services with characteristics such as innovation, manufacturing, safety and ergonomics. Kramer was given an innovation award at Bauma 2016 for its electric wheel loader 5055e.With 43% of the votes, Kramer beat all the other nominees and thus received the award in the "machine" category. Why separate what belongs together? The Kramer brand stands for all-wheel steer loaders, telescopic wheel loaders and telescopic loaders with extreme manoeuvrability, off-road capability and high efficiency. Thanks to the proven undivided chassis, Kramer wheel loaders are ultra stable in all conditions. Due to this special vehicle construction, there is no shift in the center of gravity due to steering movements. On the basis of the Ackermann steering, only the wheels move during steering. Thus, maximum payload and high stability is maintained even on full lock, and on uneven ground. Simply fill in the form and we will contact you. I have read the privacy statement. I agree that my data will be stored to answer my request. You can revoke your consent any time via e-mail to info@kramer.de.